Frustr­ated US author­ities weighi­ng variou­s option­s to move around strand­ed cargo. ISLAMABAD: Barely a month after Pakistan’s retaliatory decision to block Nato supplies for the coalition forces stationed in Afghanistan, the United States has decided to export all its cargo, including military hardware and arms, out of Pakistan. Sources told Express News that the break in supplies has frustrated US authorities to the point where they are now weighing various options to move around the cargo stranded at various locations in Pakistan. “To ensure smooth transition from import to export cargo in the Pakistan Customs Clearance System (PaCCS) and Pakistan Revenue Automation Limited (PRAL) computer systems, documents are required to be submitted to the US consulate in Karachi,” Anita added in the email. “We require all USC-6 (universal contract 2006) carriers to submit the required documents to the US consulate, Karachi ([email protected]) for cargo/supplies currently staged outside the port for export,” the email read. According to sources, US cargo, stranded in Pakistan, is worth millions of dollars and US authorities have serious concerns over the safety of the cargo as it includes hammer vehicles, dumpers, anti-aircraft guns, special carriers of anti-aircraft guns, vehicles specially built to jam communications, cranes and sophisticated weapons. Furthermore, it was learnt that the US was using Pakistani routes to supply cargo to its military forces fighting in Afghanistan since 2006 under USC-6 (universal contract 2006). Under this arrangement, US military personnel were engaged in loading and unloading of cargo while no physical checking was being carried out by Pakistani authorities. When approached by ExpressNews, Rice refused to comment. Heath was also not available to share his version on this report. Prime Minister Gilani seeks guarantee against any unilateral action in future. Goods never crossed the Chaman border in Balochistan or the Torkham border in Khyber-Pakhtunkhwa. Afghanistan-Pakistan Transit Trade agreement is allegedly being misused in wake of Islamabad suspending Nato supplies. 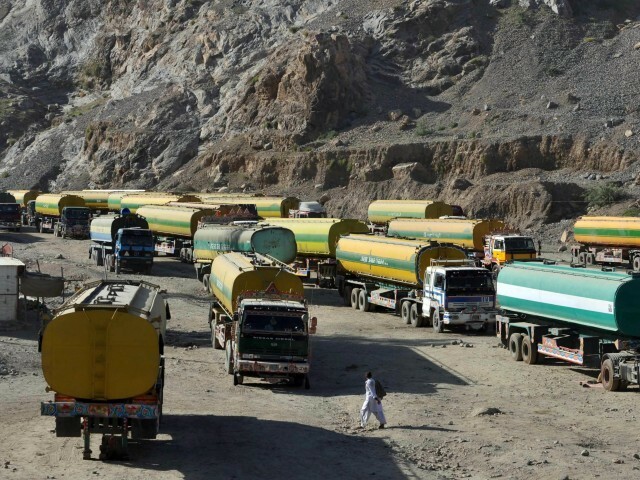 A permanent blockade on supplies to Afghanistan worries drivers . Official says Pakistan will reopen the border when public anger cools down and the route is protected. why is express tribune so reluctant to print news and opinions which elevate the spirit of Muslims? why such love for our enemies and hatred for muslims? MaShaaAllah! another achievement by the mullaahs; this time of Afghanistan. ..and our Ba Ba Blacksheep monkey donkeys are still proud to be reveling in their english-medium ignorant holes…Pakistan needs akhwanimuslimoons, ayatullahs, mullahs, and jamaat i Islami to shed it’s baighairat westoxicated slavery. Why is this such a newsworthy item, ET? Its obvious that any equipment that belongs to them is going to be shipped out! Why try to sensationlise such issues? I suggest you spend more time and effort to enlighten the people of the impact of living without their Aid first, as no doubt there are plenty of issues related to them ! Furthermore start planning for life without outside assistance as there is no replacements, from any of the so called friends either! Its a serious wake up time for Pakistan, not about their Ghairat ! Good riddance to bad rubbish ! Pretty clear that if left to the Pakistani’s it will either be stolen or blown up. It is only fair that the US bring its cargo back to its custody. It is the right of Pakistani govt to allow or not allow the passage. Nothing can be forced upon Pakistan as an independent country. Both countries should do what is best for them. good, get out of pakistan!! “such as weapons systems were supplied through the Uzbekistan” Shows that Uzbekistan is a more reliable partner in trade transit route and a partner in fight against terrorists. Is it because they do not have policy of strategic depth in Afghanistan? Oil from Iran, weapons from Uzbekistan, is it possible that Afghanistan thinking out side the box, and will soon by pass Pakistan and trade through other neighbors’? I am confused about how a comment………Another card has been played.. Is either not on topic or is abusive. Looks like Pakistan is loosing one of its trump card which is acting as a supply route. But the other trump card in the form of control of a pliant afghan Taliban is still there. Will they loose that too if the Americans pay off the Taliban with some crumbs? Another foolish step by Pakistan. Losing millions in much needed dollar revenue. An honest person. That the Taliban are controlled by PAK is the only honest comment that has been made on this topic. Another lie of US/NATO exposed. Before this they claimed all sensitive equipment is supplied through air transport. They don’t have any money to sustain air transport for most of the things. It is to be facilitated and ensured that US ‘ does not belong/possess anything in Pakistan.Be comfortable saying good bye, to evil and shame. Now US’ official have to realize this reality and truth that US’ and NATO’s troops have killed thousands of innocent people especially women,children and old persons on the name of fake terrorism in Afghanistan and also USA has damaged its economy by wasting trillions of $$$$$ on the useless war in Afghanistan and also US’ and NATO’s expensive war equipments and vehicles have been destroyed in Afghanistan uselessly and fruitlessly and troops have been killed but now the reservations of every country have been changed and US’ officials now have to leave every country and protect USA by living within USA.Because the time is changing now and every country is waking up to protect and secure its rights and territories. It should be stolen and destroyed at any cost and let US fight its own war agianst taliban which they could not win without pakistan support. US should think seriously to liberate Baloochistan, so that they can use Gwadar port freely. Bulk items are expensive to move…. you have no understanding of logistics. NATO is not without other options even if those are not the prefered route which makes resupply both more time consuming and expensive. You can be assurded there will be those in Washington and the capitals of other NATO nations who will remember the”help” PAK provided. Put heavy taxes on these cargo.. they should pay the damages. @Mullah : They aint paying any tax for their cargo ….so Pak is paying from its own pocket for their containers to pass. @ Cautious : Even if it is stolen or blown up what do u care …. U should focus on your 27 insurgencies movements in india, where a large patch of land remains ungoverned. Where even your army cant go. @Munda Baloch : U r our brother, why u playing at the hands of the enemies. That Cargo shall stay in Pakistan. Not an “inch” to move. i read a news earlier which stated that the sensitive eqipment was transported through other ruotes, now all of sudden the equipment in containers is sensitives, now US will claim that it is stolen and blame pakistan for foul play………….more rubbish thrown our way……..
Moving forward..I think Pakistan should allow that cargo to be entered into Afganistan. NEWS: 50 cargo containers(emptied first secretly) carrying weapons for Afghanistan were burned down . which they could not win without pakistan support. It is in the interest of Pakistan to prolong this conflict as it generates money for them ! They have never been on same wavelength with NATO/ISAF, as they have their own agenda and ambitions in Afghanistan. And you wonder why Pakistan has a terrible reputation? – being duplicitous and labeled the nexus of terrorism are not things to be proud of. The logistics of moving thousands of vehicles back to Karachi, and then overseas must be almost overwhelming. I suppose that Pakistan is a lot more lenient than most countries, or has been, when it comes to helping America, which would make it a little easier, but at the very least export licences and close inspections should be mandatory to check for all manner of items; narcotics for example. I would have thought that the easiest and cheapest way to get rid of the non-military cargo would be to give it to Pakistan or dump it in convenient locations. Similarly with the military equipment after it has been rendered inoperable. After all, we are only talking about a few million dollars and America has wasted several trillion dollars so far on a war, which few people, including me, understand, and should not have been started in the first place. My dear friends, If let suppose pakistan is supporting taliban in afghanistan and being duplicious with US then i firmly belief that Pakistan is doing a right job. becouse what Pakistan is doing with US is lesser then what US does with rest of the world. US is the only and only reason of terrorism in this world either they may be Japan in world war II, it may be Veitnam, It is Iraq, Afghanistan or any other middle east country. Afghanistan has already opened rail road with neighboring countries. While Pakistan is hallucinating in self grandeur and self importance, things are being put in place to isolate Pakistan. Pakistan will become the next Somalia or has it already become one? Keep living in illusions , that everyone will crush USA. I personally have never agreed with US foriegn policy since the days of their Korean adventure, however your logic is simply flawed! Pakistan simply would not have been able to survive without US handouts since its creation and all the goodies the military has been receiving over last 3-4 decades, for services not rendered but pretended without accountability too! Yet their performance in any theatre of war has been dismal ! They have never won any engagements, which they decided to play in, on contrary they manged to loose half of the nation in process, due to their attitude and adventurism ! Pakistan should really be focus its energies on economic survival, rather than trying to play a role as regional policeman, as they can not even provide its own people with basic needs. In regards to Iran, at least they are unlikely to be listening to you, as they are more than capable of making up their own minds and decisions in regards to their welfare. It won’t be US who will have to strike them, but smart money is on Israel will do the job of taking out their Nuclear Facilities, watch this space, when it happens ! Pakistan Zindabad !!! Good luck Pakistan !!! Loss of revenue to Pakistan. and Pakistan will be bombed to stone ages if the cargo doesn’t move an inch. Take your pick! I do not think anybody really wants to crush America although some people say things because they are angry, and later probably regret what they have said. However, I think that what they are really trying to say is, “please America, stop crushing countries that have not done you any harm”. Dear Hedgefunder, You never give up do you. America is still going in Korea after sixty odd years, was completely wiped out in Vietnam, sort of won in Iraq with lots of help from NATO, but never really settled the problems, still going in Afghanistan after ten years with no end in sight and lots more NATO help, plus several other problem areas, but I think perhaps you may be getting the point. Most of America’s so-called financial help takes the form of military aid with the proviso that Pakistan spends it on American military equipment. Maybe the Pakistanis have not won too many wars, but I do not think winning wars is anything to be proud of. Further, the Pakistan military may not be quite so brutal as the American military which is starting to make other evil regimes look like boy scouts. I will settle for the way Pakistan does it every time, and just hope America never tries to save me. I do not want my loved ones wiped out with drones, depleted uranium, or dreadful gun ships. India should stay out of this conflict, Pakistan is right. Don’t show your IQ here, remain couch potato, as India has never been involved in this mess ! Get your facts and homework done before making stupid comments !! Another wise decision by PAK. There will be a peace in this world only when US destroyed. They are the biggest terrorist terrorist, coward, fearfull, faint hearted, cowardy, greedy. As a nation they are simply timid. If you are talking about Israel then remember that Israel cannot even touch the Iranan Soil. By saying that your smart money Israel will do tha job for US means a dog will kill lion ehich will never be happened in this world. Dear hedgefunder, I have never heard of India’s involvement in this area either, but are you really sure? One cannot trust anybody nowadays, and we do seem to get plenty of insulting comments from Indians. When facts are presented to Pakistanis , they all of sudden become insulting, consproracies, Zionist plots etc… When will you learn to accept the basic facts and acknowledge the problems when they are staring in your faces???? We would like to see america is out of Pakistan and these containers should be charged with road tax, security tax and port tax which is ligitim under law. We have lossed every thing dure to this war on terror. I am not sure whether Russian root will be very expensive as america is already bancrupt can,t afford. And never ever cross roads with my passion my beloved Pakistan, this action was the tip of the ICEBERG that sank THE TITANIC.